Days after announcing 'Madame X', her first album in four years, the pop icon has shared Medellín, a sultry Latin-pop collaboration with Colombian singer Maluma that features airy synths, rhythmic reggaeton beats, and call and response verses. The track premiered as Zane Lowe’s World Record on his Beats 1 show on April 17, while its accompanying video is scheduled to be unveiled globally via an exclusive televised MTV music event on April 24 at 9pm BST. 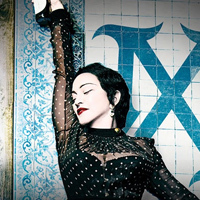 Influenced by her time living in Lisbon, Portugal, as well as her love of Latin music and culture, the album features 15 songs that are sung in Portuguese and Spanish, as well as English. It's set to arrive on June 14 and also features collaborations with Quavo and Swae Lee, as well as production by Mirwais, Mike Dean and Diplo, among others. "Lisbon is where my record was born. I found my tribe there and a magical world of incredible musicians that reinforced my belief that music across the world is truly all connected and is the soul of the universe." Competition closed. Please check our blog to see if you're a winner! Madonna brings her Rebel Heart tour to arenas in London, Manchester, Birmingham and Glasgow next month and Stereoboad have launched a new competition giving you the chance to WIN A VIP CONCERT EXPERIENCE FOR FOUR to her London O2 Arena show on December 2. Competition closes, and the winner will be announced, after 12pm on Friday November 27.